On Tuesday, Magnus Carlsen and Vishy Anand played to a draw in Game 8 of the World Chess Championship in Sochi, Russia. 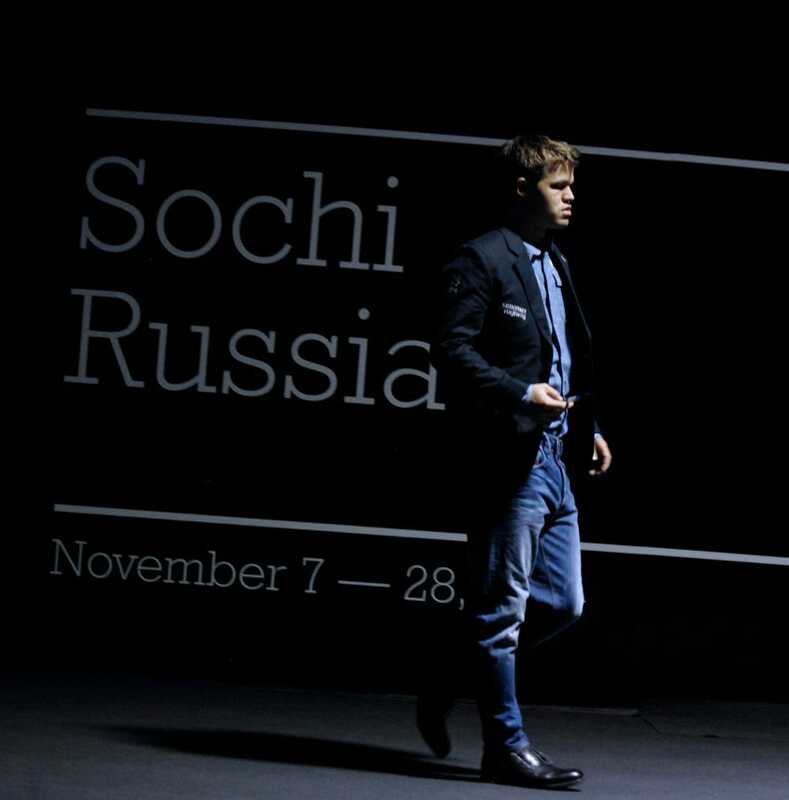 The score now stands at 4.5-3.5 in Carlsen’s favour. There are only four games left to play. On its face, Game 8 wasn’t all that exciting: it lacked the fireworks of earlier games, the blunders of Game 6, and the sheer length of Game 7 (122 moves! Just two shy of the longest WCC game ever!). But Game 8 contained at least one amazing moment, of particular appeal to amateur players. For more serious players, Game 8 also pointed to a new direction in one of chess’ most famous and popular opening at the Grandmaster level. 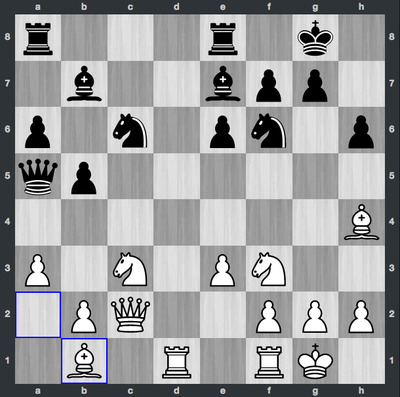 Playing white, Anand once again opened with the move 1. d4, a “Queen’s Pawn” game. I’ve covered this first move in previous recaps, of Games 1 and 3. 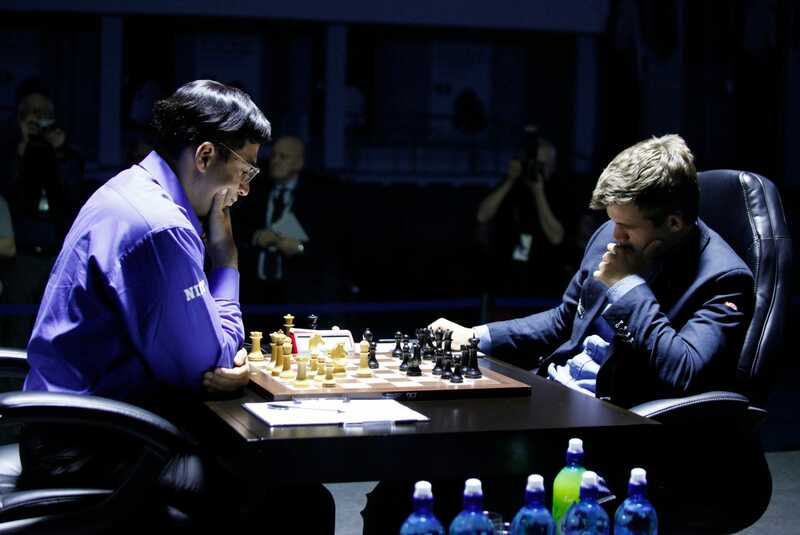 Anand won Game 3 in crushing fashion, after losing in equally crushing fashion to Carlsen in Game 2. Game 1 ended in a draw. The opening in the game was the Grunfeld Defence, but in Games 3 and Game 8, 1. d4 led to the Queen’s Gambit Declined, an incredibly important opening at the elite level of the game. I’m not a big fan of 1. d4 openings as white personally — I find it confusing, disorienting, and almost disturbing to do battle on the queenside. As black, I’m ok with 1. d4, but I generally try to the play the Grunfeld, rather than the QGD or its sister opening, the Queen’s Gambit Accepted. However, watching Anand weave a lovely mating attack in the QGD really made me appreciate what I think is actually one of the coolest things about the opening: it’s capacity to seem like all the action is on the queenside, then suddenly morph into a checkmate opportunity on the kingside. The mates are beautiful and otherworldly — unlike the more direct mates that can arise from kingside attacks. Anyway, GMs never get mated on the board — they always resign first, when they see it coming, or when they know that their position is lost. For amateurs, however, and especially players rated below 1500 (Anand and Carlsen are both above 2700), mates routinely occur, so it’s good to know how to set them up and deliver them out of different openings. Obviously, Anand didn’t mate Carlsen. But for a very brief sequence of moves, it was in the air. Queens and bishops like to work together, at certain points of the game. The key is to have long, open diagonals on the board, so that both pieces can exploit their ability to move diagonally as many spaces as they want. I’ll try to explain why Carlsen as black refuted Anand’s attacking chances with some innovative ideas, but let’s enjoy Anand’s smooth setup for a moment. Anand has placed his queen on the c2 square and maneuvered his bishop to b1. That’s a lot of power on what’s called the b1-h7 diagonal. Uncontested by black (and in this position it’s black’s move), the queen can come all the way across the board in one move and check the black king by landing on h7 (the black king can’t capture the white queen because the bishop backs up the attack). Black’s king runs to the g8 square, and white delivers mate with the queen by moving to h8. The black king has no escape. But of course black is contesting the h7 square, with the knight on f6. This is an absolutely classic checkmating problem for white against a castled black king, defended by a knight on f6: How to get rid of the knight? And look at the position! 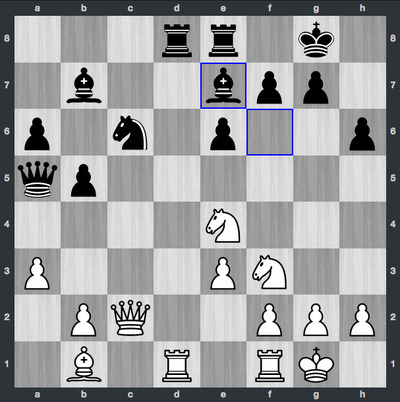 Anand can take out the knight by capturing it with the bishop on g4. He did do this, but when Carlsen took back with his own bishop, the flaw in the white checkmating formulation is revealed: the black king can now get to the e7 square and evade mate. Anand then attacked the black bishop by bringing his knight to e4, compelling the bishop to retreat. But in the process he blocked his queen’s access to the h7 square. 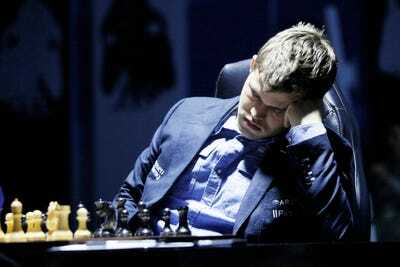 It’s wasn’t out of the question for something crazy to happen at the board: both Carlsen, 23, and Anand, 44, were probably very tired after their marathon Game 7, and in fact Carlsen actually looked at one point like he was sleeping. At the post-match press conference, he didn’t deny that he wasn’t — and to make matters worse his manner can sometimes be so languid and seemingly disengaged that he looks like he’s snoozing. The type of mating combinations I’ve outlined are rare in GM play — the best players generally see them coming, and besides, the QGD has been so deeply studied that even though it can lead to a position like the one we saw in Game 8, black’s setup is designed to defuse the threat. Note that Carlsen has a rook on e8, giving his king some breathing room, and a bishop on e7, which allows Carlsen to maintain control of the critical f6 square. Carlsen used the opening to locate these pieces accordingly, specifically to counter the mating threat on h7 and h8. This type of approach, undertaken in the opening phase of the game, is why chess players obsess over “opening theory.” If Carlsen’s rook and bishop were elsewhere, the position could be much better for white. The arrangement proves that, contrary to received wisdom, Carlsen is working on a better grasp of thorny opening theory — he’s becoming far more than a player who just plays an established opening, gets a relatively equal position, and then tries to nurse small advantages through to a gruelling endgame. In Game 8, Anand’s attack ran out of resources and concluded uneventfully after both players completely evened out their strength on the board. Wednesday is a rest day. On Thursday, Carlsen and Anand will be back at the board, and Anand will have the black pieces this time. If you want a prediction, I think that Anand will aim for another draw and throw himself into his next chance with white. Earlier in the match, I said that Anand needed to go for wins with white and black, but he’s tried that twice now as black with the aggressive Sicilian Defence and he hasn’t succeeded. Ultimately, he could use an easy draw in Game 9, to enable him to preserve enough energy at this point to press hard for a win with white in Game 10, even the match, and set the stage for two final games in which he could play for a draw as black in Game 11 and pull out all the stops for Game 12 with white. Carlsen, clearly, will simply need to hang on to his current 1-point margin to retain the title. This has been an amazing World Championship Match so far. And now it’s come down to the final stages, when strategies about how to win, or how not to lose, will become very important. You can watch the replay of Game 8 here.